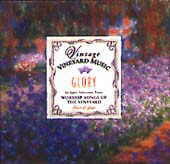 Vintage Vineyard: Vineyard Music EXTRA! These albums are combinations of the best of the original Songs of the Vineyard series. In late 1976, a small group of believers began to meet together in a home to seek the Lord. None of us realized the extent of our spiritual ill-health. We knew we were weak and tired. But we had no idea of how weak we were. Some of those who gathered together had been trying for years to serve the Lord. Others were excited in their new faith but not really going anywhere. When we gathered together, all we could do was sing to the Lord. As we worshiped we began to get well. We began to feel a spiritual strength come into our lives  strength we had never known before. Worship opened the door to a relationship with God that was totally new for us. We no longer felt compelled to do things for God. We began enjoying Him and our relationship with Him. Since that time worship has become the highest priority of our gatherings  to give Gods love back to him through love songs written for him, and through the revelation of his Word as it is taught. We see worship as part of the foundation of Gods revelation to this and every age of the church. Throughout every revival in the Church Age there have been new and contemporary songs written that express in a popular way the newfound love of God in the heart of the believer. Written in 1987, as the introduction to the songbook Glory.